Recently, a customer sent me a pretty low quality MRL sword for work. Rather than invest in doing work on it, we agreed that the sword itself was probably not worth much investment. It was to be scrapped for parts. The blade itself was good, being of standard MRL fare - so there were really no complaints here - it's handforged, with a straight fuller, and no issues. The guard was plain and functional; it was milled from mild steel and did not have any serious issues. But the large pommel was made from brass and plated to look as if it were steel. Additionally, the pommel appeared to be threaded onto a rat-tail tang with perhaps a decorative peening added. 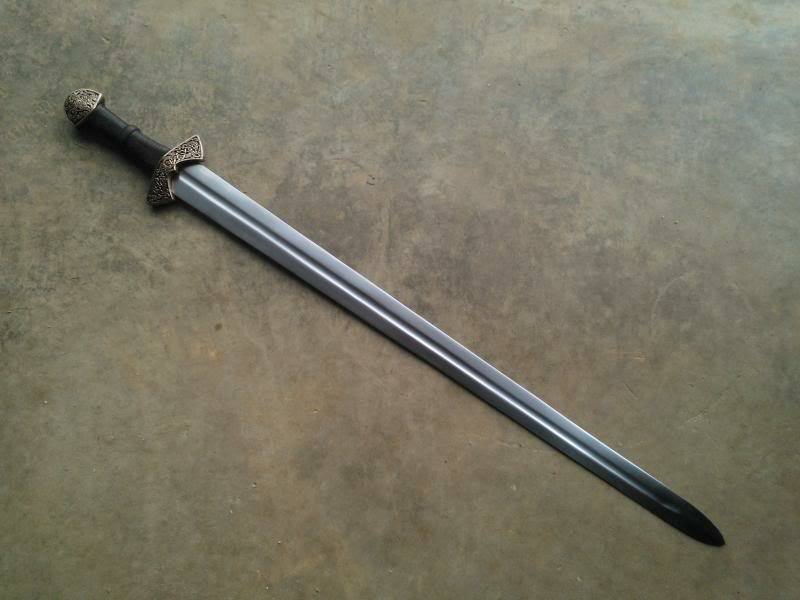 This type of sword is what many have learned to call Frankenswords. 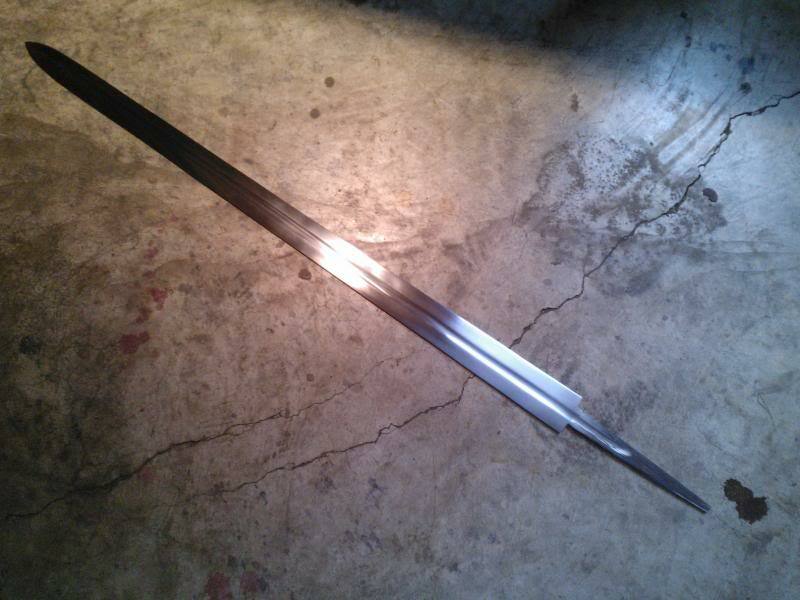 Every year when MRL does their annnual clearance sale, they seem to have a large shipment of these budget swords sent over from their forge in India where random pommels, guards, and blades are put together into a blade and sold for $50 a pop. It seems to be a way of cleaning out their warehouse of spare parts. I took it apart just to see what the deal was on the inside. 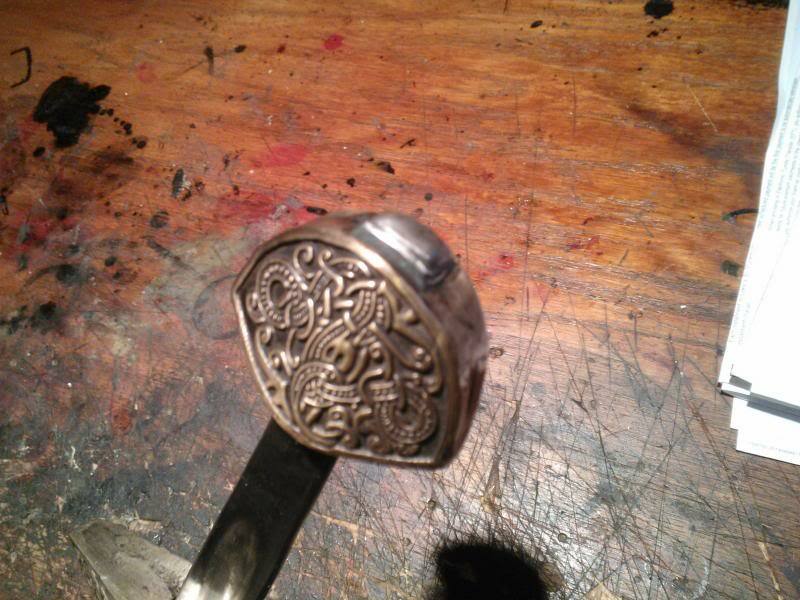 Now, just as I suspected, the tang was threaded though the plated brass pommel. In this case, they did not even peen it. They just filed it down even and plated the whole thing. There were not even that much in the way of threads on there - perhaps 1/2" worth. Since the blade is pretty much solid with a good temper and nice RC hardness (52-53 by my testing), I decided it might be worth the investment to experiment a little with it. What I did was took off 2” of blade length at the shoulders (making it a 31” blade rather than a 33” one), ground everything out nicely. I then took off the round potion of the tang, leaving a nice beefy tang to work with. I drew back the temper on the end of the tang to make it easier to peen when the time comes. I also reprofiled the tip into a proper Type XI cross section, taking out the central ridge. All in all, the blade now looks similar to a Geibig Type 2/Oakeshott Type Xa. 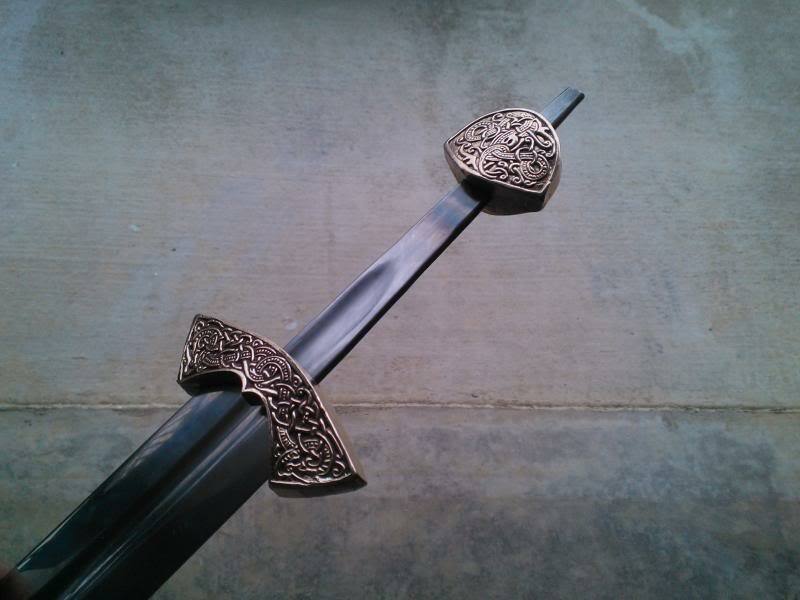 I ordered a bronze set of Suontaka (Type AE) furniture from Raymond's Quiet Press, and decided attempt to create a functional blade inspired by particular blade. There will be many differences; but I am not going for an exact replica here - just seeing how things go in an attempt to create something functional. It’s a work in progress which I will tackle here and there in my spare time. It will take a fair bit of effort to get done. Let’s see what I can get done with this thing. Perhaps this Windlass will live to see better days than it was originally intended. First of all, I noticed that the fittings from Raymond's Quiet Press are not quite to scale with the originals - which is slightly disappointing. They run a little smaller (perhaps 20% or so in difference). But, since they are here, I will do the best I can. I plan on writing RQP to see if they can adjust the scale of these for furture customers. 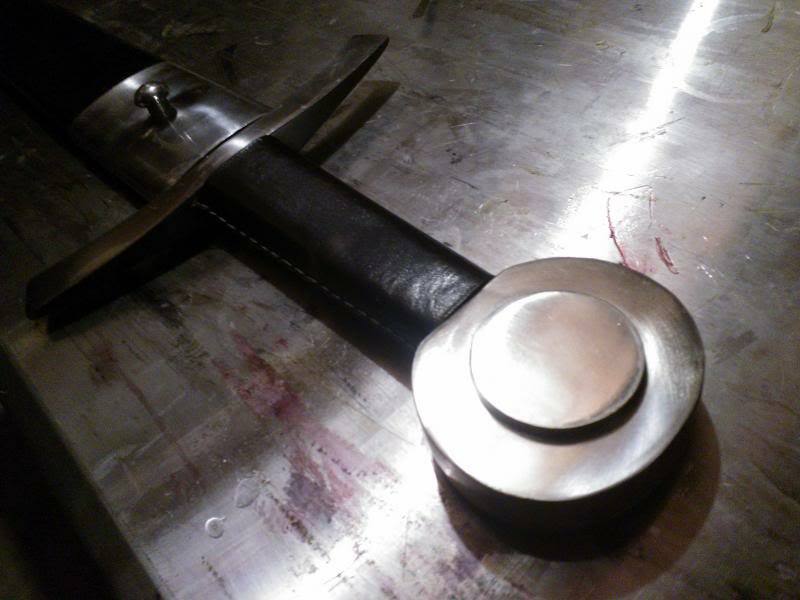 Next, although the sword guard had a pilot hole in it so I could easily begin filing it to fit, the pommel did not have a hole in it. 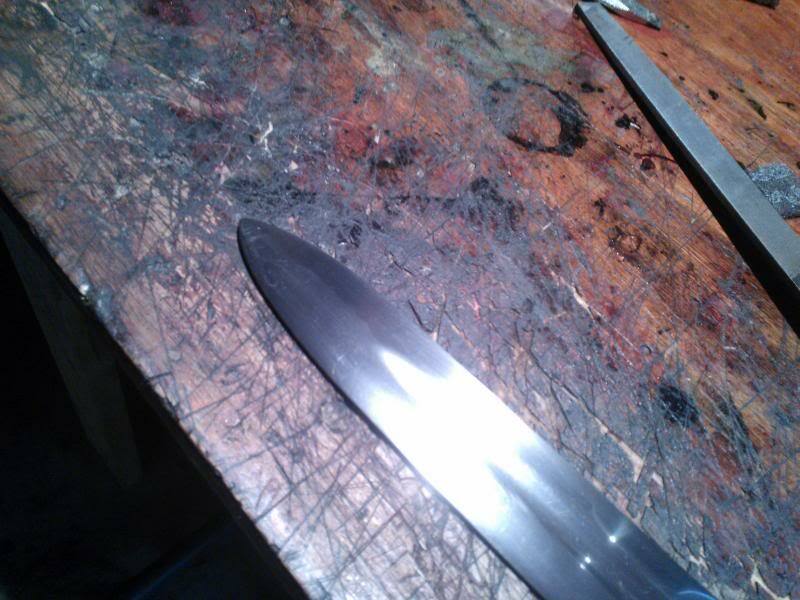 I filed the guard and got it nice and tightly wedge peened to the blade in about 10 mins - the guard will never move again . The pommel however, that was a different tale. I broke 3 drill bits trying to make a pilot hole, gave up, took the pommel to a machinist who in turn broke a bit as well. 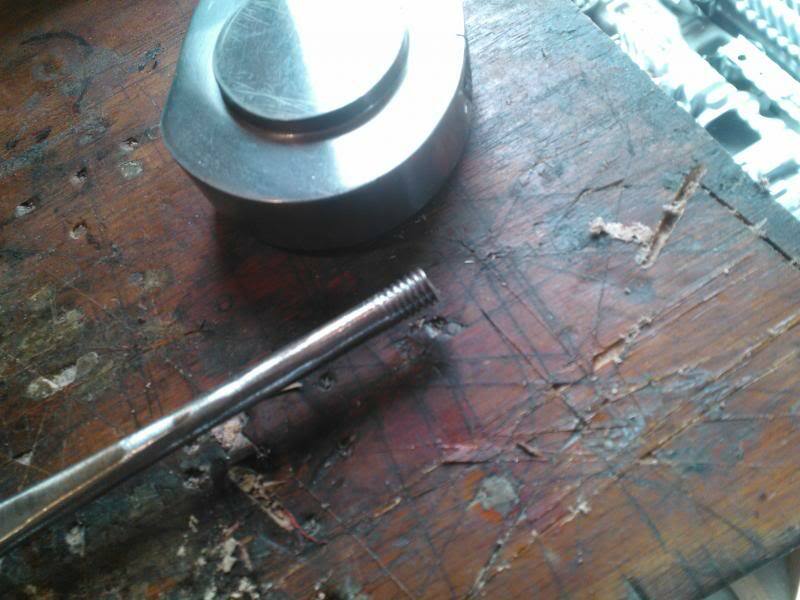 He got mad at it and put it into a mill with a tungsten carbide CNC bit, in which case, he drilled a nice 1/4" pilot hole in about 10 seconds. 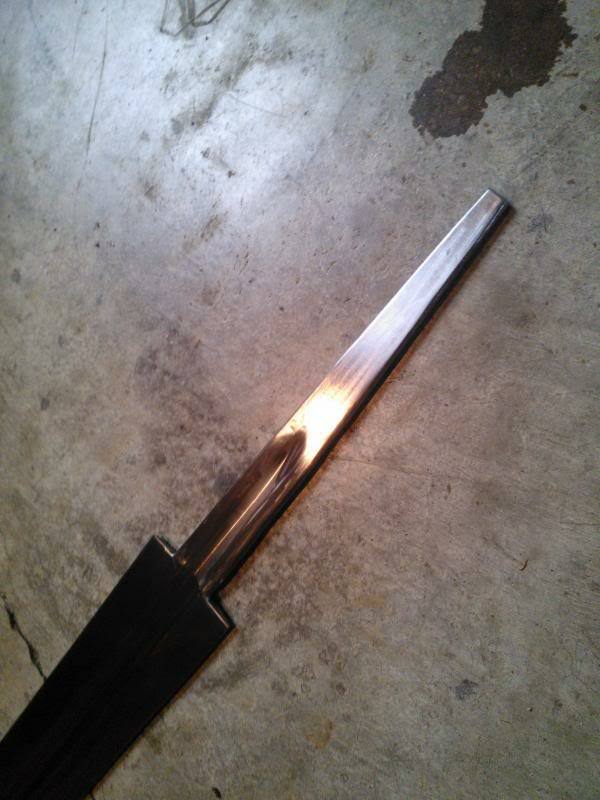 Two hours of filing later, and I had the pommel fittted over the massive tang. I gave the tang enough space for my extra large hands, which would make for about a 4" grip. A little longer than the original, but needed if I want to use the sword myself. Since the fittings are not to scale anyway, I did not figure it would make much more of a difference. On to the peening. 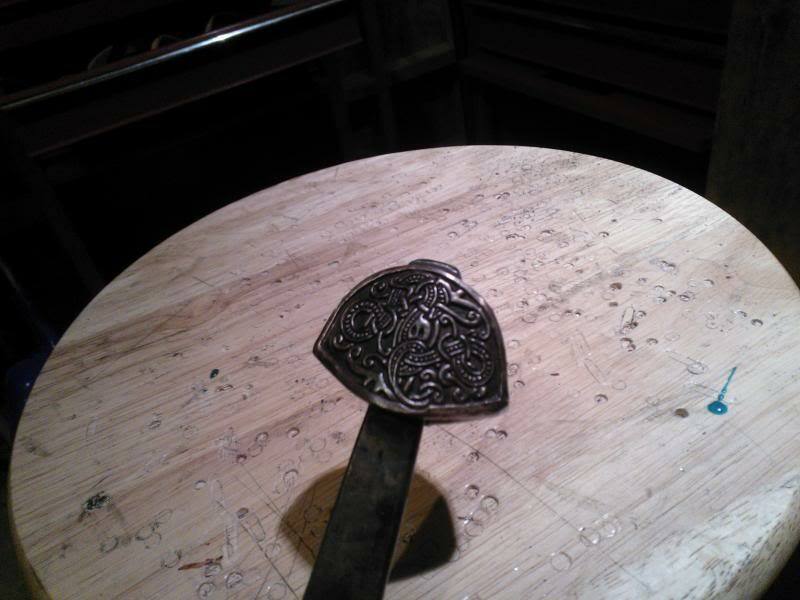 I cut the tang down to 3/8" above the pommel. I fashioned a small peen block out of a piece of steel (like on the original and the Albion version). Torched it until it was red/yellow hot and beat the hell out of it. The resulting peen was one of the best I have ever personally done, not to mention, it looks quite like the original. I am pleased with it. If I do any re-peening in the future, I will use this type of peen. 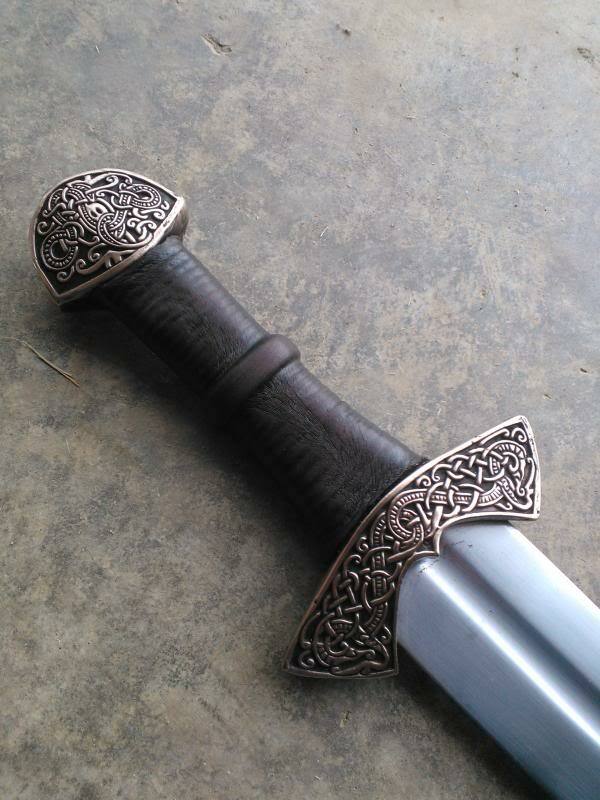 Sword is solid as a rock and already rings like a bell when struck! What could be better! OMG! THERE IS A HUGE SPIDER IN MY SHOPPE! 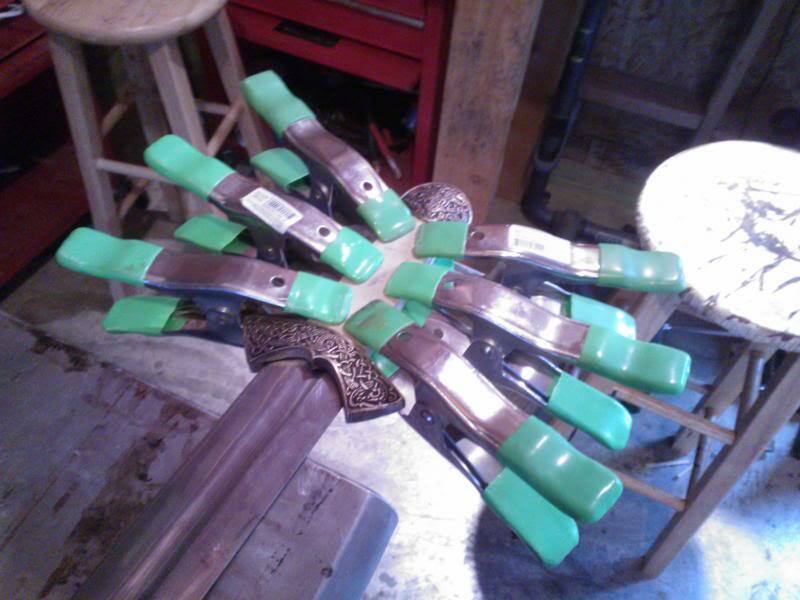 ...oh wait, that is just my clamps holding down the grip scales while they dry. Drew the profile into the grip core and roughed it in with a rasp. Going for a nice waisted shape here. A couple hours later, after working it by hand with sandpaper, I had it done and had applied the riser. Now, onto the grip wrap. Let's get this thing done already! Well, the little project is completed. I finished up with a nice worn antique dark brown wrap, cleaned her all up, and took some photos. On the wrap, I used some well worn leather and did a larger hemp cord wrap. This makes it look much older than it is. I also drew back some of the dye with a little steel wool to let the natural color of the leather show through the grip on the ridges. The casting quality from RQP was not the highest in the world, so I left the general antique appearance of the fittings rather than trying to get them all nice and new looking. The sword looks like more of a hand-me-down now, which seems to suit it nicely. 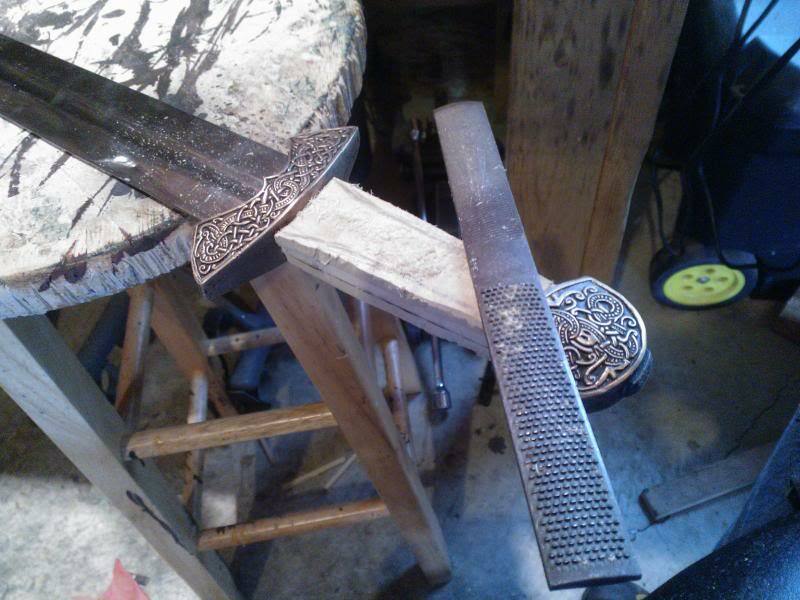 To get the antique finish, I antiqued the fittings, then buffed off the high spots with some 000 steel wool. This leaves all the details in the casting crisp and clear. 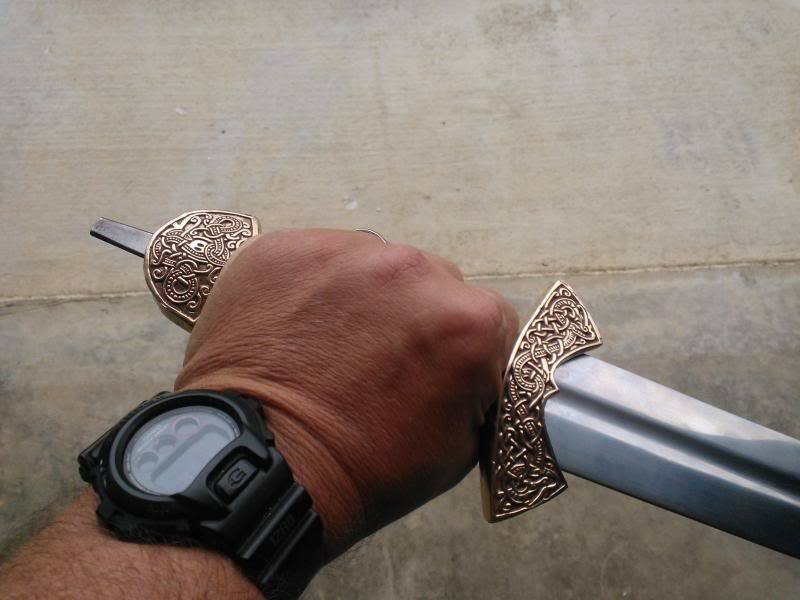 In the hand, the sword has really good presence. Although it is not that heavy of a blade, moving the PoB forward a bit gives it the authority it needs to be a good shield splitter, yet nimble enough for fast recovery. 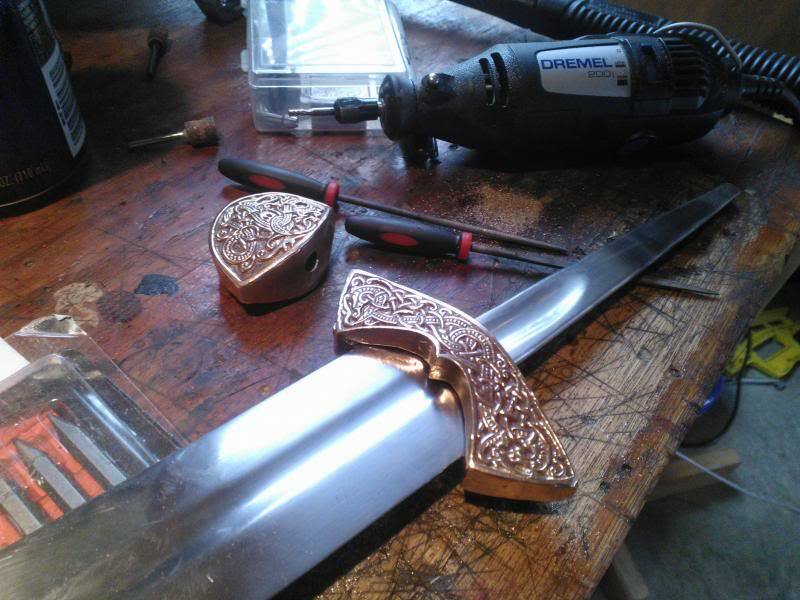 All in all, I am really happy with how this blade turned out. The monster tang makes it ring like a church bell when stuck, so it's wonderfully solid. 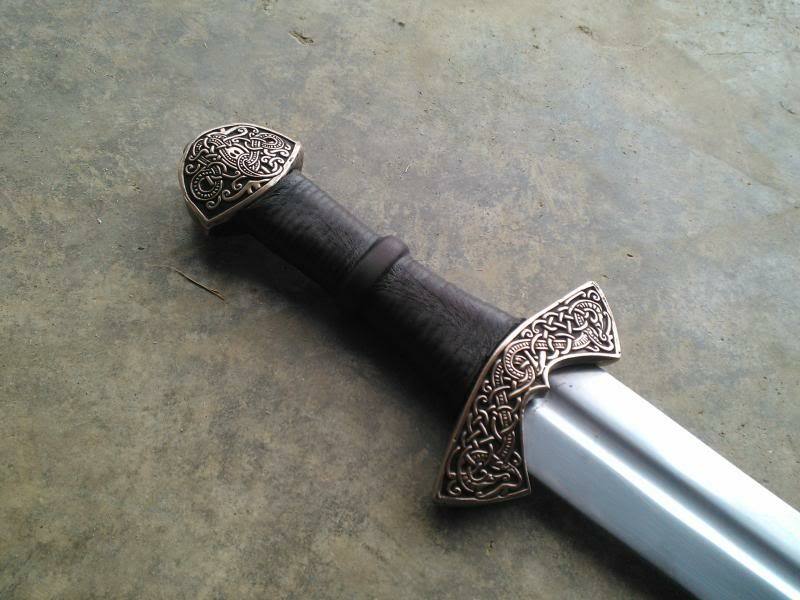 Now, due to the size variance in the fittings I got from RQP, the overall look is inspired by the Suontaka sword, but impossible to get exact - so this is not an exact replica nor a proper Type AE, but it is a working blade now with a little historical inspiration - which is probably somewhat closer than other replicas I have seen out there. Working with what I had, I made it functional and attractive and learned a bit in the process. It was quite a fun little project there! I enjoyed doing it, and although I do not know if this piece will stay in my collection or move along to a new owner, I do know that it will serve quite well for years to come. Nice job on converting that poor excuse of a sword into a real sword. That's pretty nice. I like it a lot. WOW! Nice going on that! It looks much better. Gorgeous! Fantastic work as always. A very creative way to "upcycle" some low-price components and create something awesome. Wow the finished product is very beautiful! I especially like the thick steel peen block set against the brass pommel. I love that! Recycling and upgrading - with a wonderful result! 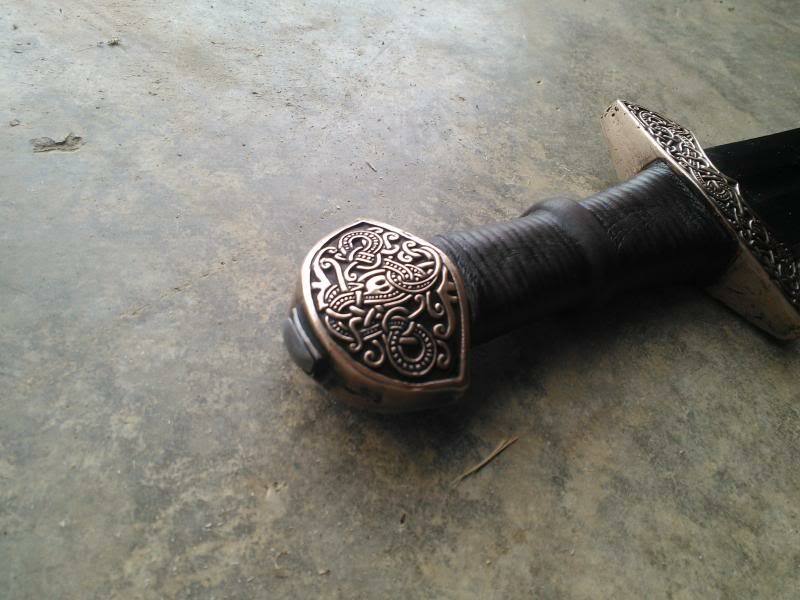 You can see how the smaller hilt components do throw the proportions off a bit. 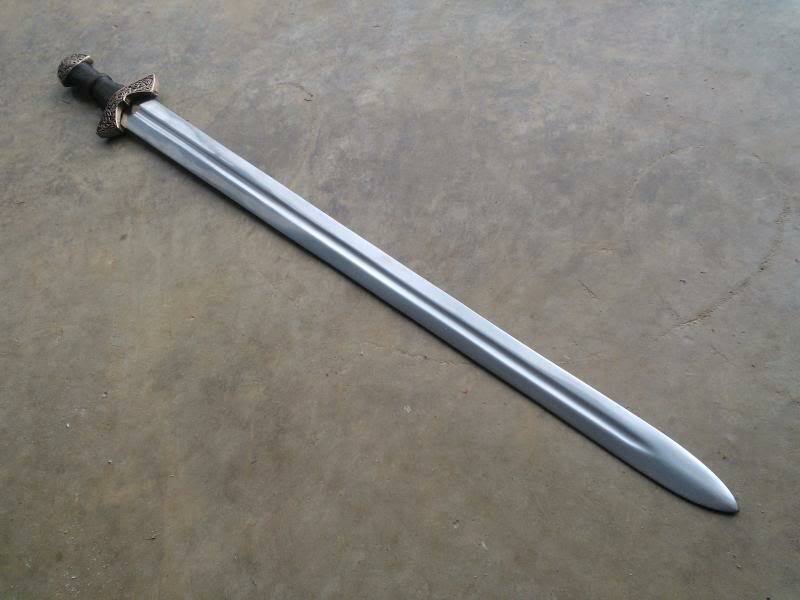 Having this sword done with components closer to the historical size would add even more to this design. I completely agree. I was concerned that doing a slightly longer grip for my bear paws would throw the preportions off before the fittings arrived. Once they got here and I seen their size ( ), I tossed any idea of getting close resembelance between my replica and the original out the window. 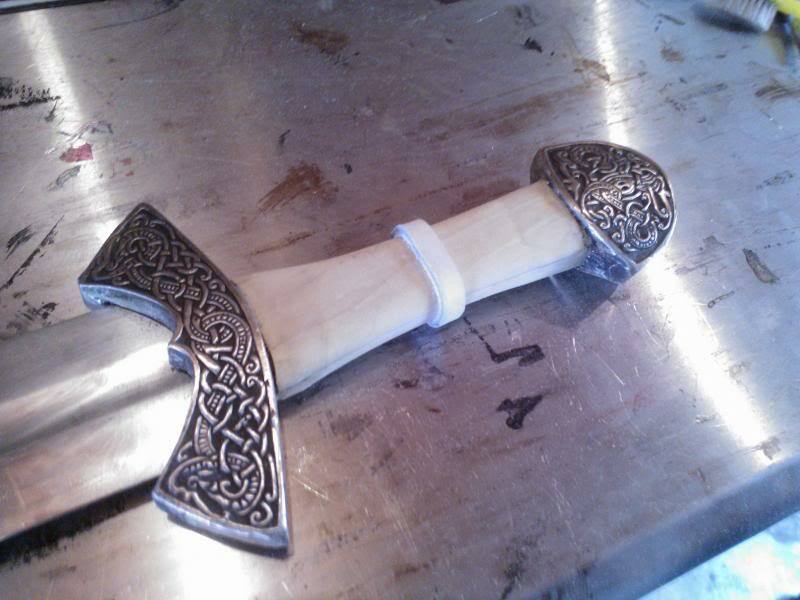 So, I went ahead as a learning experience on my peening. 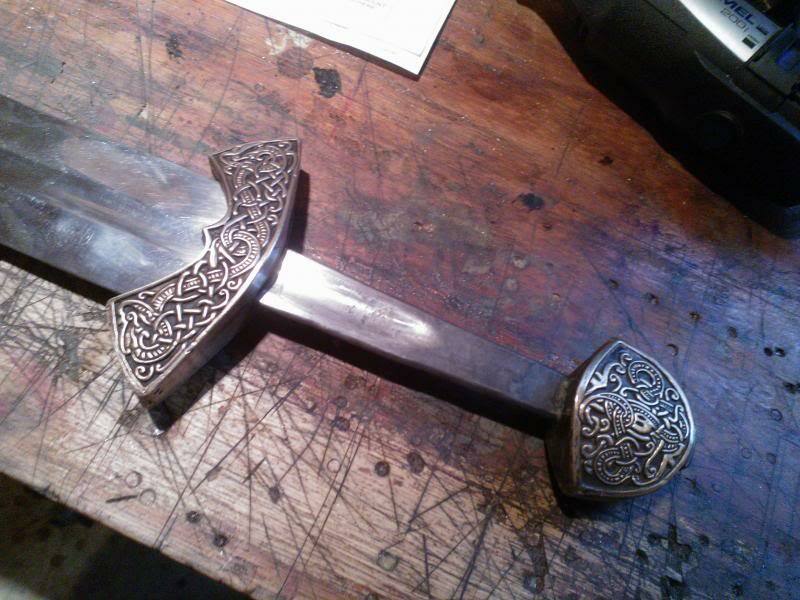 In the future, I do plan to revisit this with an H/T Viking Blade and some custom fittings which will be scaled correctly. Thanks to everyone else for your compliments! They are apperciated!